The first drawing of Hawai‘i by a European is William Ellis’ depiction of the Māhāʻulepū – Kīpū Kai coastline, with Mt. Hāʻupu as its focal point. William Hyde Rice (1846–1924) was a Kauaʻi rancher; in 1879, he bought a section of the Kalapaki ahupuaʻa from Princess Ruth Keʻelikōlani and ran Līhuʻe Ranch on it. By 1881, he sold most of this land to Līhuʻe Plantation and bought the Kīpū ahupuaʻa from Princess Ruth, he continued to raise cattle, as well as grow sugarcane on Kipu Plantation. In 1891, Queen Liliʻuokalani appointed Rice to be the Governor of Kauaʻi, a position he held until overthrow in 1893; Rice was the last Governor of Kauaʻi. Rice married Mary Waterhouse in 1872 and they had eight children. Rice passed away on June 15, 1924; a monument on Kipu Road was “Erected In Loving Memory By His Japanese Friends” on June 15, 1925. Jack Waterhouse joined A&B in 1930; he became corporate secretary in 1936 and vice president and treasurer in 1958. He served as director at A&B for 40-years and was also president of Alexander Properties and Waterhouse Investment Co. In 1948, Waterhouse bought Kipukai Ranch from Rice, his in-law. His birds were subsequently released (or escaped during hurricane Iwa (1982,)) adding to the recovery of nēnē on the island. In 1977, Waterhouse agreed to deed the property to the State. Waterhouse’s heirs control the property until that happens. In addition to visitor tours/ATV attractions, the land has been the backdrop and subject of various films – the latest was The Descendants. Kīpū Kai encompasses several separate beach areas. Until the land transfer to the public and access protocols are established, the area is not accessible to the public. The single road that leads over the ridges of the Hāʻupu Range into Kīpū Kai is private property and blocked by gates. Most visitors arrive by boat or kayak. Most of the public recreation at Kīpū Kai occurs at ‘Long Beach,’ with swimming, snorkeling, bodysurfing, bodyboarding, surfing, fishing and beachcombing. A small cove in the arc of Mōlehu Point at the north end of Long Beach is a popular snorkel site for tour boats. By agreement between commercial boat operators and Kīpū Kai landowners, onshore tour activities are confined to the adjacent beach area. 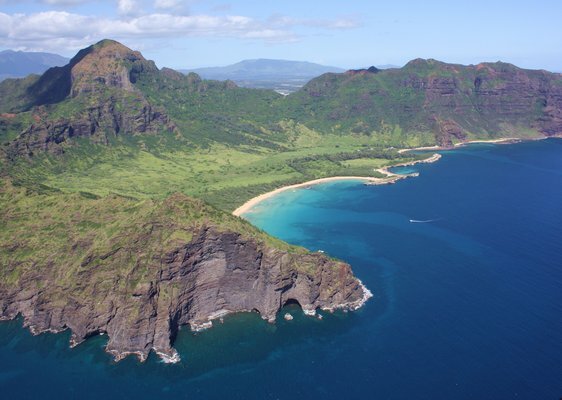 The image shows Kīpū Kai from the air (JimG, Yelp.) In addition, I have added related images in a folder of like name in the Photos section on my Facebook and Google+ pages.